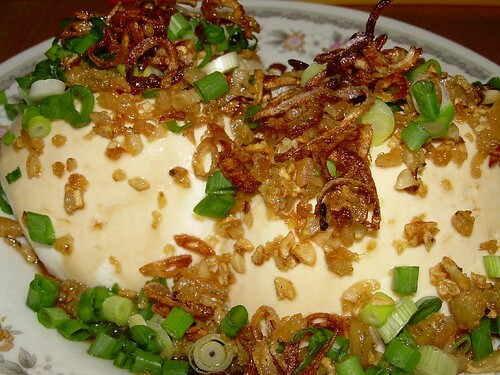 Tofu is also known as beancurd and comes in many varieties. It can be sold uncooked or even deep-fried. I always have a fondness for tofu and this is one of the simplest recipes for tofu which I would like to share with you. Toast minced dried prawns on a frying pan at medium heat (no need to put oil) till brown and fragrant. Remove and place aside. Fry shallots with cooking oil till golden brown, remove from oil and allow to dry. Keep oil aside. Boil sufficient water in a pot and gently place tofu into the boiling water (ensuring that tofu is covered by the water). Boil the tofu for 1 minute. Remove tofu gently and place on plate. Drain excess water. Drizzle oyster sauce and approximately 1 1/2 teaspoons of the oil over the tofu. Sprinkle fried dried prawns and fried shallots over the tofu together with chopped spring onions / red chilli. I just have to leave a comment on this recipe..it brings back too much memories of my younger days. My mom makes this for us all the time….sigh…memories!